THE HAGUE, WILLEMSTAD - The number of Venezuelan refugees being detained by the Coast Guard is rising, but there is no reason for concern. This is according to the Kingdom Minister of Defense, Jeanine Hennis-Plasschaert in a letter to the Lower House of the Dutch Parliament. Her letter was based on the Annual Report 2016 of the Dutch Caribbean Coast Guard. In total, 86 illegal immigrants were detected by the radar last year in the Windward Islands, while 36 illegal immigrants were arrested in the Leeward Islands. 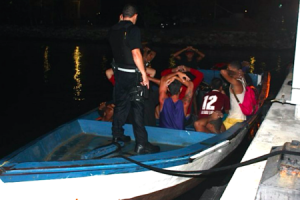 The Coast Guard points out that there was an increase in criminal activities, such as the drug and weapons smuggling. Deputy Prime Minister Norberto Ribeiro said during this week’s press conference that there is currently no mass influx of Venezuelans, but according to him, the situation can be reversed at any moment. He held the press conference with Lesley Fer, Risk and Disaster Coordinator.